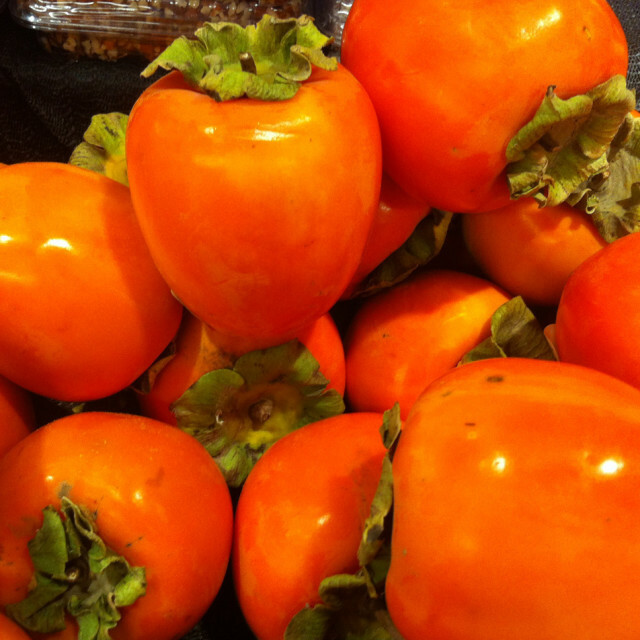 Persimmons are called Kaki in Japan, where they are the national fruit. The Hachiya variety, shown here, has a pucker-inducing astringency until it ripens. In my head I have this image – it’s the perfectly prepared hostess (yes: “host-ess,” the “ess” being an important part of the picture, sexist though I know that is). She is impeccably dressed, her house is always both tidy and clean, and she is at all times ready with lovely goodies to feed any guests who might drop by unannounced. Of course this person doesn’t actually exist, or at least not in my world, and certainly not in my house. After all, who drops by unannounced these days, when you can text that you’re waiting outside, and you’re hungry? That gives anyone ample time to prep a snack for tired visitors who happened to be in the neighborhood, right? Holiday season is a time for catching up with friends and family, though, so entertaining at a moment’s notice is a handy trick this time of year. And even the hostess with the least-est can be ready to offer more than beef jerky or stale popcorn. The modern day, achievable version of perfection is to keep a stash of classic crackers in the cupboard, long-living cheeses in the fridge, and supplement with occasional seasonal exotic fruits. Good choices of exotics this time of year would be persimmons and quince. Both are autumn-ripening fruits that have never really had a heyday in the US of A (although the Algonquin Indians were fans of persimmons, calling them “pasiminan” and “pessamin,” depending on the dialect). Just having these novel fruits around the house will make it welcoming. Quinces give off a lovely rosy fragrance, while persimmons are a beautiful orange color and take a long time to ripen – which is to say, both would make an excellent centerpiece on the dining room table. If the fruits are ripe, you can peel and serve them. (If they’re not ripe, but you want your guest to leave quickly, serve Hachiya persimmons, which when unripe contain tannins astringent enough to make your guest leave in a hurry.) Otherwise, hit the cabinet: quince paste lasts a long time and will match nicely with a little array of crackers and cheese. Fig paste is another good option. The cheese and crackers are of course leaders of the long-lasting and classic category. The holidays are a great excuse to go to a gourmet shop, try some new types and stock up. Pick up a trio of cheeses that cover the spectrum from soft and buttery to firm and sharp. Stay local or venture to foreign lands via cheese tasting. Most will last a long time in the fridge, after all. Same with the classic Carr’s water crackers or other crispy vehicles for the yummy cheeses. Foster and Dobbs or the Cheese Bar are good places to start the cheese search. The fruits can be had at better grocery stores. After the guests are gone, if the persimmons have ripened, try peeling them and mixing a cup or two of the jelly-like pulp into a quickbread or pancake batter, or a spiced cookie dough. As for the quince, when it’s ripe, it can be a nice little surprise in a baked apple dish, as a substitute for about a quarter of the apples. Check out recipes here. Persimmons may ripen at different rates, so if one ripens first, scrape out its pulp and freeze it until enough have ripened for whatever recipe you are concocting.